David Bryce was on of Scotland's leading architects in the 19th century. Best known at the time for his country houses, he also designed a number of churches and commercial buildings. His recasting of the Bank of Scotland (shown in the background picture) is perhaps the most prominent, featuring on much Scottish currency as well as dominating The Mound. Bryce architectural features and massing. Born in 1803, Bryce was fortunate to be apprenticed to William Burn, another leading Scottish architect some fourteen years senior. Bryce adopted and expanded upon many of Burn's methods and basic designs, and eventually become Burn's business partner. It was unusual for an apprentice to eventually become a partner in the same office, and this illustrates the high regard Burn had for his pupil. However their relationship became increasingly fractious, with Burn eventually moving to the London office and dissolving the partnership in 1845. Bryce remained in Edinburgh, and his output until his death in 1876 is almost entirely located in Scotland, with a few commissions in Ireland (mostly now Northern Ireland) and just two projects in England. Bryce's smaller houses combine Burn's careful planning of both form and function with a simple but bold treatment of each façade. Typical devices include large canted bay windows corbelled out to square at first floor height, and decorative elements copied from original Scots Baronial buildings of the 16th and 17th centuries such as tourelles and bartizans. The larger houses continue this theme, but with more dynamic massing, frequently involving a large tower above or behind the entrance door. This would lead to a grand reception hall, often with a staircase to the first floor, with the flights and arches arranged to frame the grand descent of the hosts to their gathered guests. A suite of interconnected reception rooms provided further indications of their hosts' good taste, and usually looked out on a garden previously hidden from the arriving guests. Guests would then move into the dining room, which had a door connecting through a butler's pantry to the kitchen, itself between the service yard and the many storage and service facilities of the basement. As the vast scale of the entertaining rooms was unsuited to everyday life, the entrance front would often be balanced by a private wing, where the residents could live their everyday life on a more domestic scale. As this way of living became impractical in the 20th century, so these larger houses became redundant, and none of Bryce's largest houses survive unaltered today. His commercial architecture has a better survival rate, and while some is in the Scots Baronial style of his country houses, much draws on Italiante palazzo and classical models. This accomplished switch to a completely different style makes his buildings less easy to readily identify from those of his contemporaries, and many a Bryce building lurks on an Edinburgh street initially unrecognised. This website is intended to be a detailed collection of Bryce's known buildings. It is written by Dr Alastair Disley, an architectural historian who has spent many years visiting and studying Bryce's remaining works. Unfortunately his parallel career as a university lecturer in the field of Music Technology had stalled development until recently, and a web hosting failure wiped the previous, partially complete website. 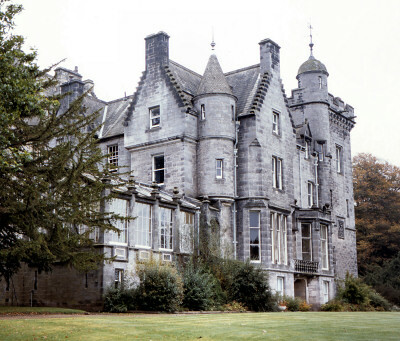 Alastair is also developing a comprehensive collection of lost Scottish country houses, and the completion of that database is taking priority at present.